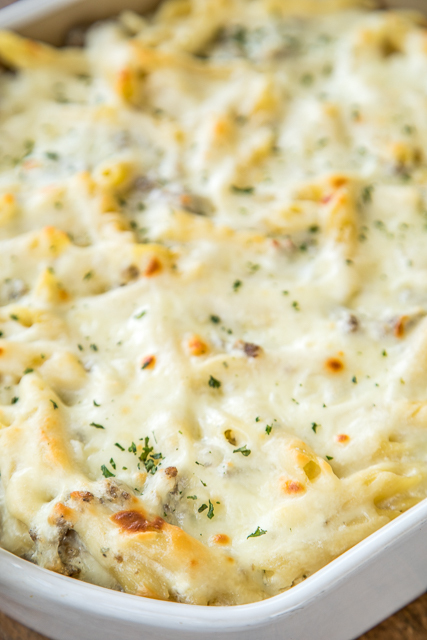 This Three Cheese Italian Sausage Alfredo Bake was a huge hit in our house. 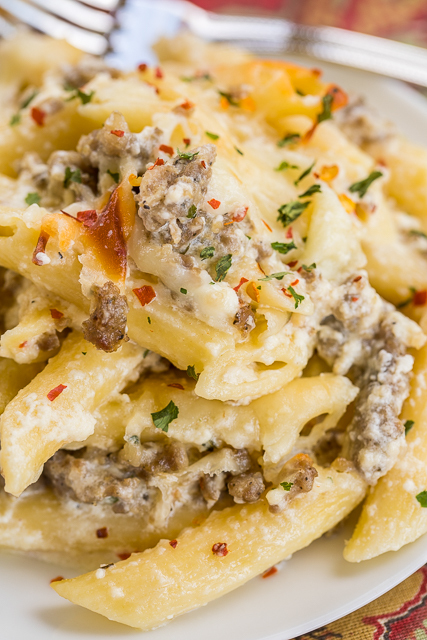 Pasta and Italian sausage tossed in ricotta, mozzarella, parmesan and Alfredo sauce. SO good! This can be made ahead of time and refrigerated or frozen for later. Perfect for this busy holiday season!! I love being able to just pop a casserole in the oven and not have to make dinner after a busy day. 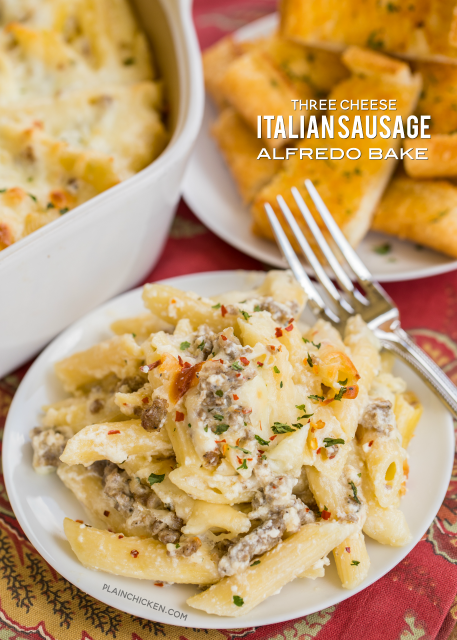 This Three Cheese Italian Sausage Alfredo Bake makes a TON! It is great for a crowd. You can even split it between two pans and freeze one for later. It is also great reheated the next day for lunch. 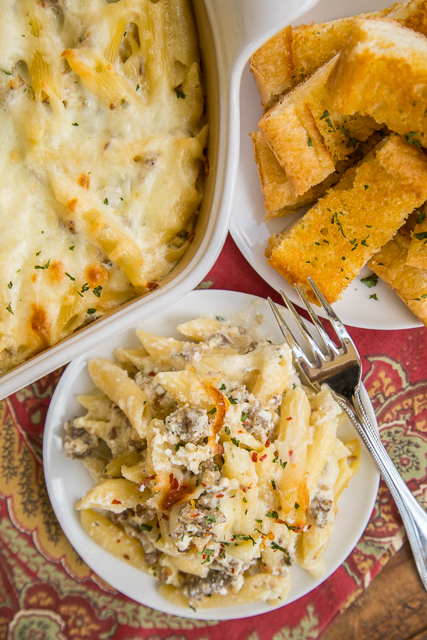 All you need is some garlic bread and a simple salad and you have a delicious feast in a snap! Preheat oven to 350 degrees. Lightly spray 9x13-inch pan with cooking spray. Prepare pasta according to package directions; drain and return to pot. 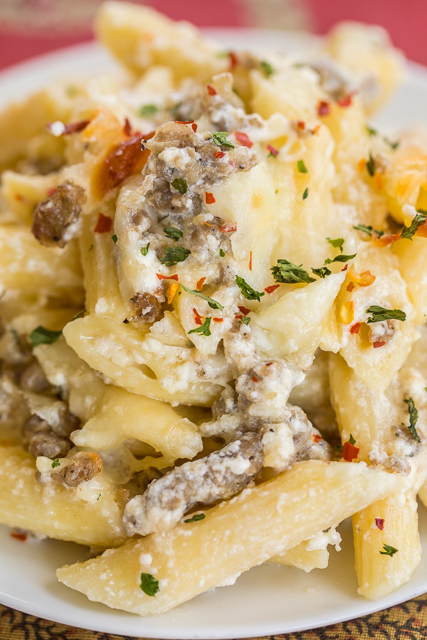 Add cooked sausage, Alfredo sauce, sour cream, ricotta, garlic, eggs, parmesan and parsley. Stir well. Pour pasta mixture into prepared pan and top with mozzarella cheese. Bake, uncovered, for 30 to 40 minutes, until bubbly. What brand of Alfredo sauce do you use? If you make it ahead and refrigerate does that change the cooking time or do you take it out and put it on the counter first and for how long? Love all your recipes!!! I like Trader Joe's alfredo sauce. If you make it ahead of time, you will need to add a few minutes to the cooking time or let it sit out for about 30 minutes before baking. Enjoy! Have you ever tried to freeze this recipe?